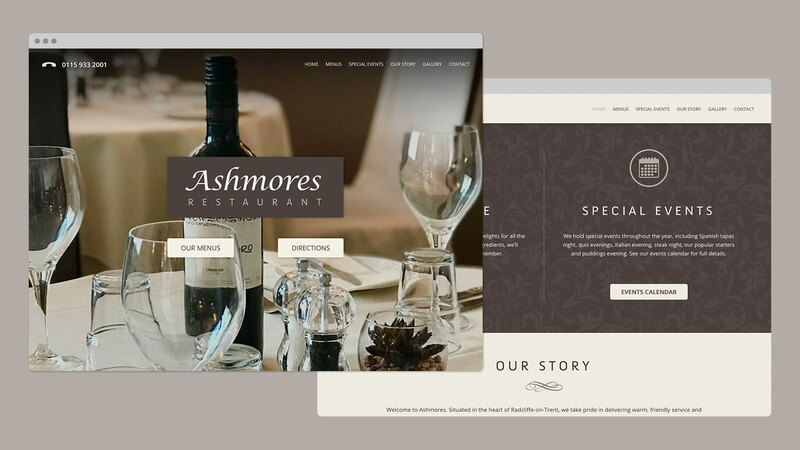 Situated in the heart of Radcliffe-on-Trent, the family run Ashmores Restaurant has built up a loyal following since opening in 1996, providing a friendly service and creating mouth-watering dishes. Recognising though that they faced ever increasing competition, owner Mark Ashmore and daughter Amy were interested in how they could more effectively promote the restaurant online, and paint a true reflection of their unique setting. Given the task at hand, we sat down with them to discuss how a rejuvenated website presence could help to see the business continue to flourish and secure new custom. Standing in their way were the day-to-day tasks which we all know sap huge pockets of time. Writing menus, creating new culinary delights, planning event nights… never mind looking after the loyal customers. Added to the concerns, were factors beyond their control in our fast-paced world. 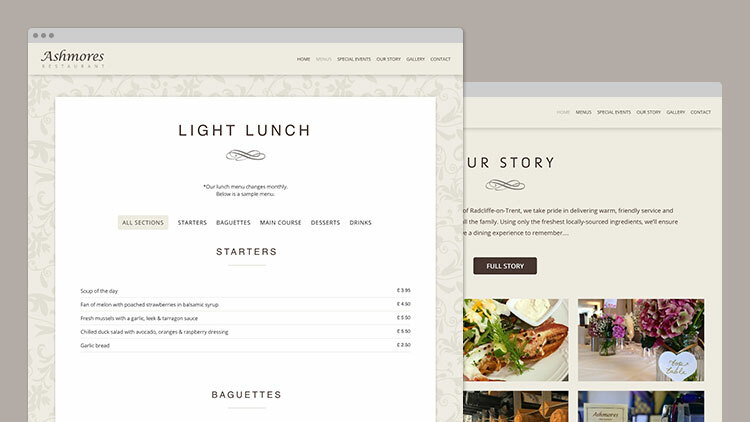 Increasingly more decisions to book a table are done based on first impressions online. Customers demand the ability to see what’s on the menu at a glance on the latest smartphone, and to be kept up-to-date on all special events. Faced with this, Mark, Amy, and the team battled their own worries. As with any business operating successfully for over 20 years, fear of change brought about a reluctance to try something new. Being short on time also lead to questions as to what impact developing a new website would have on their day-to-day running of the restaurant. Furthermore, there were concerns over whether they’d see any results, and the limitations of cashflow ruled out paying a large some of money. Thankfully though, they needn’t have feared as these were all easily overcome. 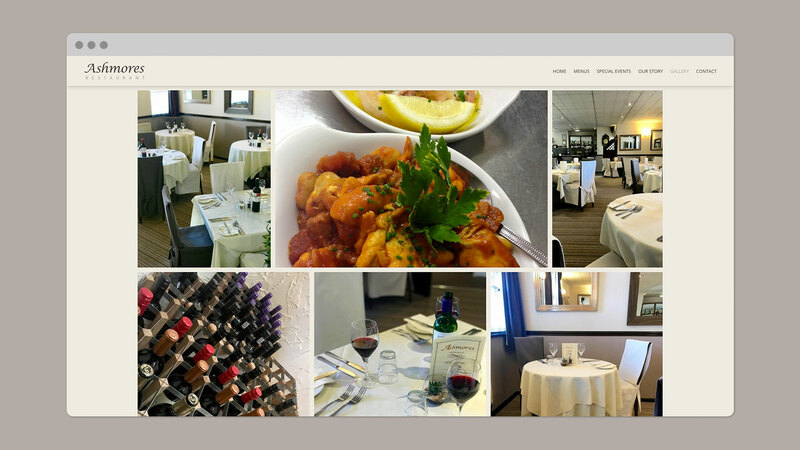 Our vast experience in producing websites within the restaurant sector meant we were able to guide them through, in easy to follow stages. As Mark and Amy will testify, the structured process took up very little of their time, and a new website was launched in under 4 weeks from the initial meeting. As for a potential drain on resource - this proved to be completely unfounded. They left us to do what we do best, and we let them get on with their busy schedule. 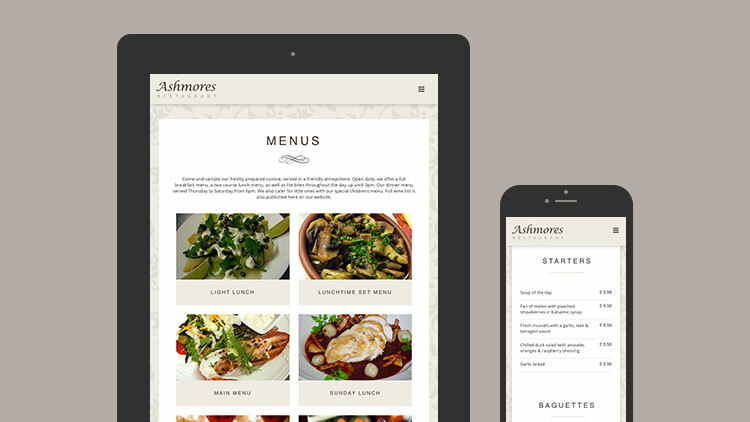 Amy Alice Ashmore - Ashmores Restaurant. In respect of what it’s done for the business, this can be best measured through the influx of fresh enquiries received through the website enquiry form. Previously the only method of contact was via phone or email, which could on occasion get missed. 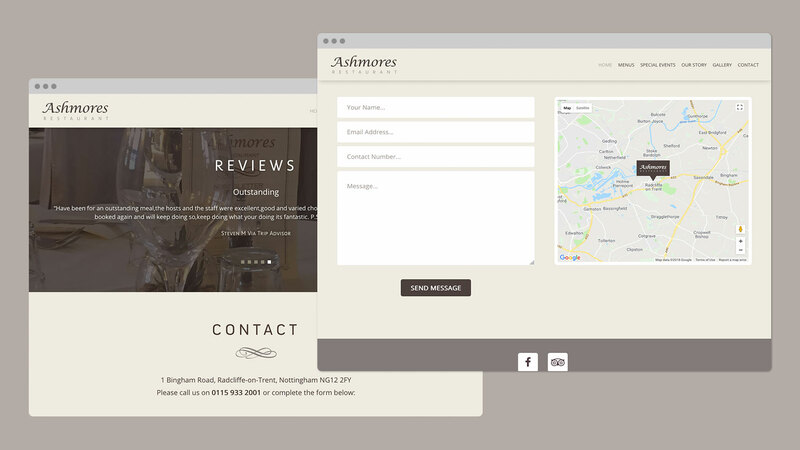 Since launching the new website Ashmores have seen on average 10 enquiries per month submitted through the website. They are now better equipped to record and track enquiries, and the resultant bookings have easily offset the low level of investment made.